Windows Live Video Messages - Use your webcam for something good for a change ~ Android Forever! Send Video Messages to the important people in your life to enjoy when they wish. With Windows Live Video Messages, recipients don't have to download and play video files on their PC. Instead, videos are stored with advanced security technology on a Web site. With Windows Live Video Messages, you can control who gets to see your videos by locking or unlocking the messages you send. Only unlocked messages can be forwarded or saved by recipients of your Video Messages. 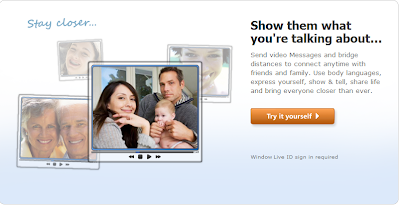 Sending, managing and repeated viewing of Video Messages requires a free Windows Live ID. This is not required for a single video viewing.